Do u every like reading about autism? I admire the author with his courage to write about autism and horses. I like this book because it has many great details. It also talks about when the father and son gets to go riding on the horses and the son gets to know the horse well. Children with autisms would become friends with any animal as if it was an family member I would like the author to write about amnesia. My favorite character is Rowan because he fall in love with the horse and that’s what people like him do. The book has 114 reviews on amazon. AUTHOR Robert Isaacson was born in London. He is married to a women named Kristin and they had a son named Rowan. This book has 114 reviews on Amozon. The horse digs its back hooves into the dirt and gives one last, scrambling effort to reach the top of the rise. She took off in a gentle jog-trot, back toward the barn. My son sitting up in perfect balance. Riding away from me. Free. 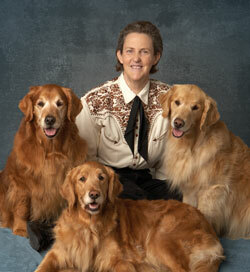 Drawing from her own experience with autism and her distinguished career as an animal scientist, Temple Grandin has provided readers with extraordinary insight into how animals think, act, and feel. Her books include The Way I See It, and the national bestsellers, Thinking in Pictures, Animals in Translation, and Animals Make Us Human. We were eager to hear what Grandin thought about Rupert Isaacson and his family's quest to go to the ends of the earth to help their son. Read her exclusive Amazon guest review to find out. This is a fascinating book. It is the tale of a family's journey to Mongolia with their five-year-old son who has autism. The family travels to the northern remote areas and lives with the nomads and herders away from the cities. I loved the descriptions of the nomad way of life, and that they were so accepting of a child with autism. Rowan loved baby animals and the people did not mind when he grabbed a baby goat and climbed into one of their beds with it. During the trip, Rowan developed improved language and behavior. He also had a magical connection with horses. There are many wonderful passages about Rowan’s exploits with a Mongolian horse named Blackie. Rupert Isaacson was surprised at how accommodating the Mongolian people were. They tolerated Rowan's pushing, yelping, and joyful rushing about. At the end of the book the family get a rude awakening when a German tourist who was a psychologist disapproved of bringing a child with autism to a national park to view wild horses. I was interviewed by Rupert Isaacson before he wrote his book and we discussed perhaps the shamans and the healers in some traditional cultures had autistic traits. Their rituals with rhythmic chanting and repetitive movements have similarities to autistic "stims." When I was little, I went into a calm trance-like state when I rocked and dribbled sand through my hands. Children with autism need to be exposed to lots of interesting things and new experiences in order to develop. One of the reasons the trip to Mongolia was so beneficial was that Rowan could explore lots of fascinating things such as horses, streams, plants, and animals in an environment that was QUIET. The Mongolian pastureland was a quiet environment free of the things that overload the sensory system of a child with autism. There were no florescent lights or constant noise and echoes. Some individuals with autism see the flicker of florescent lights which is like being in a disco with strobe lights. When I was a child, loud sounds hurt my ears.